Serotonin – a chemical that has roles in multiple brain functions, including mood, sleep and cognition – is manufactured by clusters of brainstem neurons gathered in the raphé nuclei. A reliable, non-invasive imaging method for assessing raphé neuron activity would be valuable for understanding serotonin signaling in depression and related conditions. 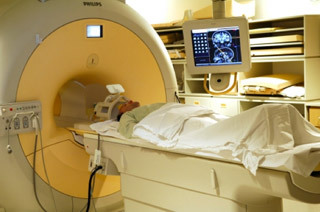 Using functional magnetic resonance imaging (fMRI) for raphé neurons has been challenging because of noise and artifacts. Now, Ronald Salomon and colleagues have evaluated a different fMRI method (time-series analysis) to study raphé neurons. They acquired fMRI scans in 11 patients after a control diet and after a diet that transiently diminishes serotonin (acute tryptophan depletion) to alter raphé neuron activity. Time-series fMRI revealed an increase in raphé fast oscillations during the tryptophan depletion diet and a decrease in connectivity of the raphé neurons to other brain areas. The findings, reported in Psychiatry Research: Neuroimaging, suggest that time-series fMRI may be useful for assessing raphé neuron function.